The ocean plays a vital dominant role in the Earth's carbon cycle. The total amount of carbon in the ocean is about 50 times greater than the amount in the atmosphere, and is exchanged with the atmosphere on a time-scale of several hundred years. At least 1/2 of the oxygen we breathe comes from the photosynthesis of marine plants. Currently, 48% of the carbon emitted to the atmosphere by fossil fuel burning is sequestered into the ocean. But the future fate of this important carbon sink is quite uncertain because of potential climate change impacts on ocean circulation, biogeochemical cycling, and ecosystem dynamics. The ocean plays a vital dominant role in the Earth's carbon cycle. The total amount of carbon in the ocean is about 50 times greater than the amount in the atmosphere, and is exchanged with the atmosphere on a time-scale of several hundred years. Carbon atoms are constantly being cycled through the earth's ocean by a number of physical and biological processes. The flux of carbon dioxide between the atmosphere and the ocean is a function of surface mixing (related to wind speed) and the difference the concentration of carbon dioxide in the air and water The concentration in the ocean depends on the atmosphere and ocean carbon dioxide partial pressure which, in turn, is a function of temperature, alkalinity (which is closely related to salinity), photosynthesis, and respiration. Carbon is also sequestered for long periods of time in carbon reservoirs (sinks) such as deep ocean and ocean sediment. Prior to the Industrial Revolution, the annual uptake and release of carbon dioxide by the land and the ocean had been on average just about balanced. In more recent history, atmospheric concentrations have increased by 80 ppm (parts per million) over the past 150 years. However, only about half of the carbon released through fossil fuel combustion in this time has remained in the atmosphere, the rest being sequestered the ocean. Global observations of the spatial and temporal patterns of carbon exchange and understanding the underlying processes that regulate this exchange is critical for predicting the future behavior of these carbon sinks. NASA's strategy for reducing climate change uncertainty includes improving land, ocean, and atmosphere carbon cycling models, and, more importantly, providing the new observations required to locate global sources and sinks of carbon, quantify their strengths, and understand how they depend on environmental factors that are rapidly changing. New measurements of carbon in the coastal ocean and of organic particle content or profiles throughout the ocean will be needed to reduce uncertainties in coastal carbon fluxes and to quantify carbon export to the deep ocean. 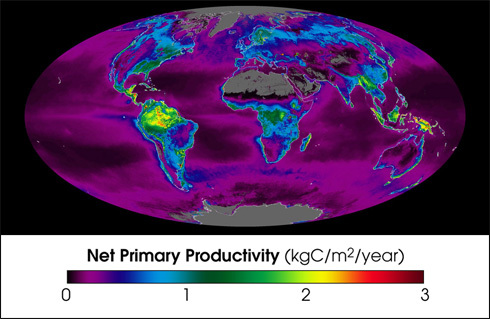 NASA will partner with other agencies to better understand carbon export. In 5-10 years, an intensive Southern Ocean carbon program will be needed to resolve uncertainties in the size, dynamics, and global significance of the Southern Ocean as a carbon sink, the processes controlling this sink, and the response of the sink to climate change in the Southern Hemisphere. In order to improve process characterizations in ecological models, more sophisticated measurement technology than are currently being used will be required. 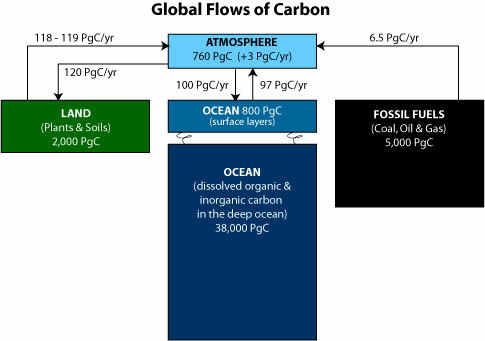 This diagram illustrates the relationship between Physical and Biological Oceanography and the Carbon Cycle. It shows a pyramid with Carbon Cycle, Physical Oceanography, and Biological Oceanography at the corners with links to each of the sides that explain how each pair of topics is interrelated. Biological processes influence dissolved carbon dioxide concentrations (Carbon Cycle) through net primary production by phytoplankton, and respiration. Physical oceanography links to biological oceanography through controls on mixed layer depths/dynamics, nutrient fluxes, and temperature which influences phytoplankton growth rates and primary production. Physical oceanography influences the carbon cycle through its modulation of the biology and also through processes that control carbonate chemistry (temperature, alkalinity/salinity) and carbon dioxide flux rates between the air-sea interface (surface wind speeds). Both physical and biological processes in the ocean affect the carbon cycle. In addition, physical processes influence the net production of biological oceanography. Physical oceanography influences the carbon cycle through its modulation of the biology and also through processes that control carbonate chemistry (e.g., temperature, alkalinity/salinity) and carbon dioxide flux rates between the air-sea interface (e.g., surface wind speeds). The ocean "solubility pump" removes atmospheric carbon dioxide as air mixes with and dissolves into the upper ocean. Carbon dioxide is more soluble in cold water, so at high latitudes where surface cooling occurs, carbon dioxide laden water sinks to the deep ocean and becomes part of the deep ocean circulation "conveyor belt", where it stays for hundreds of years. Eventually mixing brings the water back to the surface at the opposite end of the conveyor belt in regions distant from where the carbon dioxide was first absorbed, e.g., the tropics. In the tropical regions, warm waters cannot retain as much carbon dioxide and carbon dioxide is transferred back into the atmosphere. Physical oceanography links to biological oceanography through controls on mixed layer depths/dynamics, nutrient fluxes, and temperature which influences phytoplankton growth rates and primary production. For example, in areas of shallow mixed layers, phytoplankton are exposed to more light than in deep mixed layers, and can grow more rapidly, i.e., less light-limitation. On the other hand, when mixed layers deepen, more nutrients are entrained from below, and phytoplankton can grow more rapidly, i.e., less nutrient-limitation. Thus, phytoplankton growth is optimal in situations where neither light nor nutrients are limited. This is dramatically demonstrated in the North Atlantic during the spring when phytoplankton populations bloom. In this case, wintertime deep mixing has enriched the surface with nutrients. Increased springtime solar illumination both provides more light for photosynthesis and shallows the mixed layer via heating. In March, the bloom begins at mid latitudes and slowly moves northward reaching high latitudes in June as sun elevations increase. Biological processes influence dissolved carbon dioxide concentrations (Carbon Cycle) through net primary production by phytoplankton, and ecosystem respiration. The "biological pump" is the photosynthetic up take of atmospheric carbon dioxide by ocean microorganisms, resulting in long-term sequestration of carbon in the deep ocean via particle sinking, where is it removed from contact with the atmosphere for millions of years if the particles reach the bottom and are buried in sedimentary carbonates. Oil and coal are examples of marine animals that have been buried in sediments for millions of years. Through photosynthesis, microscopic plants (phytoplankton) assimilate carbon dioxide and nutrients (e.g., nitrate, phosphate, and silicate) into organic carbon (carbohydrates and protein) and release oxygen. Production based on nitrate is called "new" production. Through respiration, microorganisms consume these organic compounds, releasing dissolved organic byproducts such as ammonium and particles. Ammonium can be used as a plant nutrient for photosynthesis or "regenerated" production. Additionally, certain phytoplankton can use atmospheric nitrogen, i.e. nitrogen-fixing phytoplankton, rather than nitrate and ammonium. Their role in the ocean primary production is currently being studied. While nitrate is one nutrient, another nutrient that appears to be limited is iron. One source of iron in the ocean is from dust clouds. 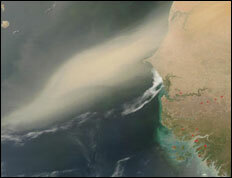 This image shows a large plume of dust blowing off the Sahara Desert and out over the Atlantic Ocean. This Moderate Resolution Imaging Spectroradiometer (MODIS) image was captured by Terra satellite on April 30, 2003.
Credit: Jacques Descloitres, MODIS Rapid Response Team, NASA/GSFC. 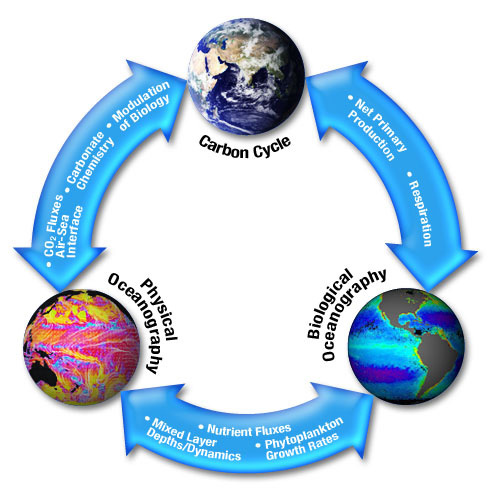 NASA plays an important role among U.S. agencies in developing better capabilities to understand, monitor and predict the global carbon cycle through support for remote sensing, modeling and field studies (e.g., FIFE, BOREAS, and LBA...see Diane Wickland for details). Satellite observations provide global coverage on a routine basis at a sufficiently high spatial and temporal resolution to observe a variety of important physical and biogeochemical processes and the linkages between them, especially when different satellite observations (ocean color, SST, surface winds, sea surface height) are combined with in situ data in an analysis in numerical models. Satellite measurements play a major role in the study of the carbon cycle because of their global synoptic temporal and spatial coverage. Satellite data are well suited for estimating scales and variability of physical and biological properties of the ocean surface serving to constrain models of physical and biogeochemical processes and for estimating global primary production, calcite, fluorescence line height, chromophoric dissolved organic matter absorption, photosynthetic available radiation, and sea surface temperature, winds, and sea surface height are generated operationally. Satellite measurements of surface winds and sea surface temperature, and future sea surface salinity measurements are used for carbon dioxide flux estimations. Wind speeds are required for most gas transfer function formulations, and carbon dioxide solubility is a function of sea surface temperature and alkalinity (salinity). Strategies have been developed to obtain global flux coverage on seasonal time scales through a combination of in situ observations, satellite measurements, modeling, and model data assimilation. Sea level data from satellite altimetry missions for certain areas such as the equatorial Pacific can be used to infer thermocline depth, integrated heat content, and new production. The ocean component of the global carbon cycle is a key component of the climate system, regulating on annual to millennial time-scales the uptake, storage, and release to the atmosphere of carbon dioxide (carbon dioxide) and other climate relevant chemical species.